What is Atypical Teratoid Rhabdoid Tumor (AT/RT)? by Rishi Lulla, M.D., M.S. 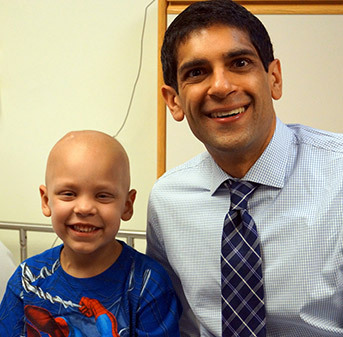 Dr. Lulla is a St. Baldrick’s researcher studying brain tumors in children. He explains AT/RT symptoms, treatment options, and how research is helping kids with AT/RT. AT/RT is formally called atypical teratoid rhabdoid tumor. It’s an extremely rare type of brain tumor that mainly affects children under age 3. Occasionally, older children can be diagnosed with AT/RT. We don’t know what causes most pediatric brain tumors. However, about 10% of all AT/RT cases have what’s called a germline mutation, or a hereditary genetic abnormality that increases the patient’s risk of developing AT/RT. AT/RTs make up about 3% of all newly diagnosed brain tumors, with about 100 new cases each year in the U.S.
What are the signs and symptoms of AT/RT? AT/RT cells under the microscope. Photo by Marvin 101 via Wikimedia Commons. 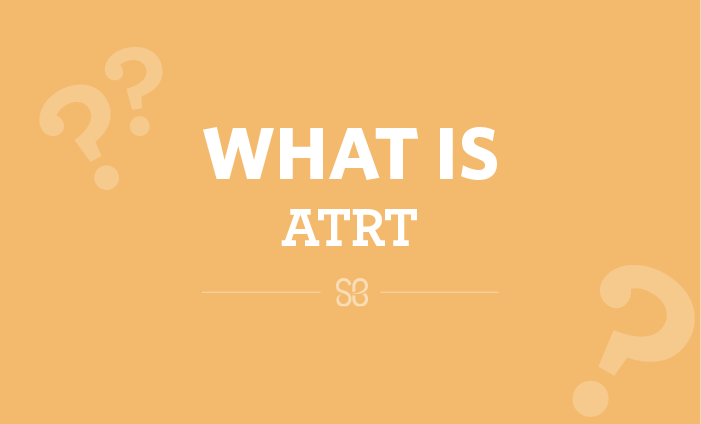 The signs and symptoms of AT/RT depend on the child’s age and where the tumor is located. It’s important to note that all of these symptoms can also be caused by much more common childhood illnesses. If a doctor suspects a child has a brain or spinal cord tumor, they will order a CT scan and/or an MRI of the brain and spine. If they identify a tumor, a pediatric neurosurgeon will then try to remove as much of the tumor as possible. It may be impossible to take out the entire tumor depending on its location. 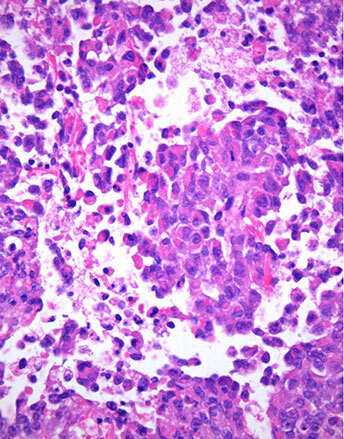 A pathologist will then look at the cells under a microscope to determine what type of tumor it is. Because some AT/RTs are caused by a hereditary genetic mutation, we also recommend a blood test for a mutation in a particular gene called SMARCB1. This helps identify families who are at risk for having other children with similar conditions. What treatment options are available for kids with AT/RT? Until very recently, treatment options for AT/RT were limited and unfortunately, most patients with AT/RT ultimately died of their disease. However, with contemporary treatment regimens, about 50-60% of children with AT/RT are now surviving five years from diagnosis. Dr. Lulla with one of his patients. Several factors affect an individual child’s survival, including their age at the time of diagnosis, and whether the tumor has spread to other areas of the brain or body. All AT/RT treatment regimens are very intensive, and most involve a combination of surgery, chemotherapy, and radiation. Some children may also receive high-dose chemotherapy along with what’s called an autologous stem cell rescue, where doctors collect the child’s own stem cells from their body, save them in a freezer, give the child very high doses of chemotherapy, and then give them back their stem cells to help them recover from the chemotherapy. How has research helped change the outcome for kids with AT/RT? Up until 15 or 20 years ago, we didn’t even know what AT/RT was. We thought it was just a medulloblastoma because they look similar under the microscope. But now we know that it’s very different from other brain tumors, and that’s actually helped us because now we know how to treat it better. Currently, researchers are attempting to further understand the biology of AT/RT — what’s driving the tumors to be formed — to help identify better, more targeted therapies. Since AT/RT treatment is so intense, many survivors are at risk for late effects such as slow growth, learning difficulties, and hearing loss. As a result, several clinical trials are being developed to determine how we can improve the survival rate while minimizing the toxicity of the treatment. Dr. Lulla is a St. Baldrick’s researcher at Lurie Children’s Brain Tumor Program in Chicago, Illinios. He is studying ways to identify and monitor pediatric brain and spinal cord tumors.